The Charlie Hebdo terrorists didn’t avenge Islam: They became the caricature. Islamic terrorists think they are avenging the caricature of their faith. Actually, they are the caricature. 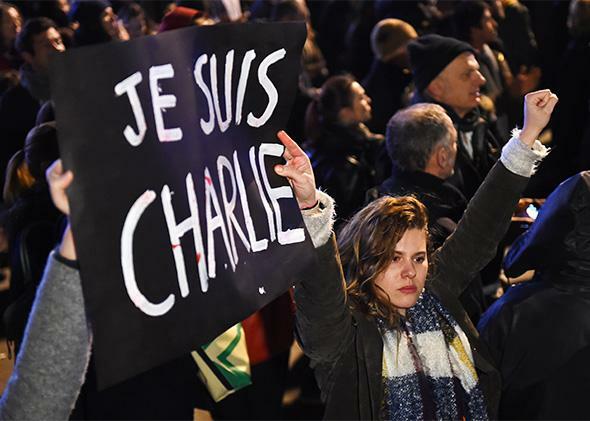 A woman holds a banner that reads “I am Charlie” in French in Marseille, France, on Jan. 7, 2015. Charlie Hebdo made fun of Islam. It poked fun at all religions, and it loved to ridicule extremists, but it didn’t shrink from antagonizing Muslims. In 2006, it reprinted Danish cartoons that mocked the prophet Mohammed. In 2011, it published a “Sharia” edition in which “guest editor” Mohammed promised “100 lashes if you don’t die of laughter.” A year later, the magazine depicted the prophet naked. On Wednesday morning, its Twitter account wished a happy, healthy new year to ISIS leader Abu Bakr al-Baghdadi. The fantasy of these terrorists, like those who previously bombed Charlie Hebdo and attacked a Danish cartoonist, is that they’re honoring Islam. But they aren’t. They’re disgracing it. When you murder people in the name of Allah, you fulfill the most pernicious of all Muslim stereotypes. You do so not in ink, but in blood. Your crime sows fear of all Muslims. You don’t avenge the caricature. You are the caricature. Intolerance and violent rage are staples of anti-Islamic imagery. The Danish cartoons depicted Mohammed wearing a bomb in his turban and telling suicide attackers to stop blowing themselves up because heaven was “out of virgins.” Another drawing, recently printed in Charlie Hebdo, portrayed an inept jihadist under the caption, “Still no attacks in France.” The magazine’s current issue features Michel Houellebecq, whose new novel Submission envisions France seven years from now, ruled by Islamists who oppress women. 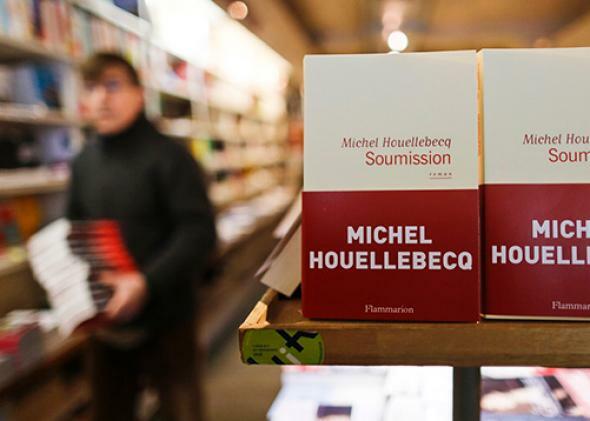 Soumission (Submission) by French author Michel Houellebecq, displayed in a bookstore in Paris on Jan. 7, 2015. Islamic moderates who protest these caricatures are undercut by Islamic radicals. Charlie Hebdo insults all religions. Its current issue mockingly questions the existence of Jesus. But Christians haven’t responded with bullets. Three years ago, after Charlie Hebdo’s office was bombed, its editorial director, Stéphane Charbonnier, pointed out that the magazine was “provocative on many subjects. It just so happens that every time we deal with radical Islam … we get indignant or violent reactions.” Now Charbonnier is dead. The problem isn’t just the violence. It’s the celebration from other quarters of the Muslim world. On social media, there are comments celebrating Wednesday’s “blessed” attack and telling the killers, “You pleased our hearts.” There are congratulations to the terrorists for shouting “God is great” and striking “a paper known for its abuse of Islam.” Pluralists who speak for most French Muslims are denouncing the atrocity. But France’s far-right National Front was already on the rise. This attack could help it take over the country. Maybe Houellebecq was wrong. The dystopia on the French horizon isn’t a state run by Islamists. It’s a state run by the anti-immigrant right. If that happens, the regime will owe its ascent not to cartoons, but to the indelible, all-too-real images of what happened in Paris this week.